The new entry at O’Hara School in Eugene includes fingerprint identification. EUGENE — What began at O’Hara’s 2016 annual auction as a successful appeal has put O’Hara Catholic School at the cutting edge of school security. When donors were asked to raise their paddles to create a fund dedicated to enhancing and maintaining building and campus security, the more than 500 attendees responded by committing more than $90,000 to the school. Work began shortly thereafter, adding a biometric fingerprint reader to the front entrance. Over the summer, an additional set of doors were added to the foyer, preventing visitors from neglecting to check in at the front office. When designing the second set of doors, Principal Tammy Conway was determined that the additional security would not give the school an institutional look or feel. “Maintaining the warmth and welcome of our entrance was a high priority in the design,” she says. 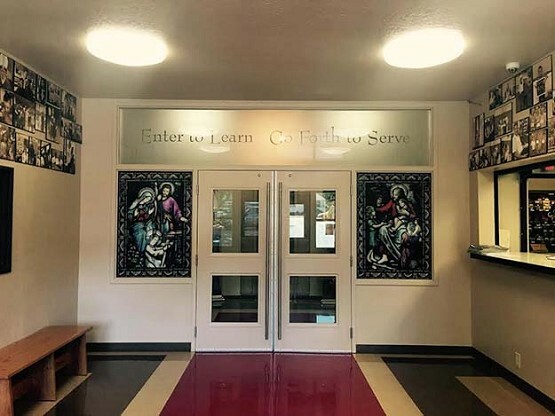 With the help of O’Hara parent, Tony Westover of E & S Hardware and Supply, O’Hara’s new entry includes both stained glass and etched glass, and is in keeping with the welcoming atmosphere. The door design includes reinforced security glass, and a second biometric fingerprint entry system. The biometric entry systems include the ability to capture and store fingerprint data. O’Hara’s front doors are always locked, with fingerprint access for parents and staff. Other visitors to the school must be buzzed in by the front office staff to gain entry. Additional security cameras, parking lot lighting and an increased number of staff radios are other elements of the enhanced security measures at O’Hara. O’Hara staff also has participated in two trainings led by the Eugene Police.